With the 64 teams announced this weekend, office pools across America and around the world will be adding a little excitement to the US college basketball playoffs this month. But no one is putting up as perfect a prize for the perfect brackets as Intertops Sportsbook. 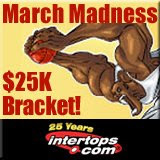 Intertops March Madness Bracket will pay $25,000 for the perfect bracket. And perfect bracket or not, Intertops pays out. For those that think it’s virtually impossible to predict all 64, if there is no perfect bracket Intertops will split the $25K prize among the best 25 tips. Full details are available at http://www.blogger.com/www.intertops.com/sportsbook. One Intertops punter in particular is going to enjoy the Final Four championships in Detroit. In a random draw from all customers who bet on college hoops, Mike A. from Arizona won Intertops’ Final Four Prize Package just by betting on college basketball games during the season. One of Intertops’ biggest prize packages of the year, his Final Four all expenses paid trip includes four nights at a top hotel, upper level tickets to the Semi-Finals & Final Game and flights to Detroit. Intertops, the very first sportsbook to take an online wager and still one of the most popular and trustworthy books in the world, is upping its deposit bonuses for March Madness wagering. There’ll be a 20% deposit bonus up to $200 until the 22nd and then again for the Final Four April 3rd to 6th. They must be delirious with Big Dance excitement because Intertops is also doubling its loyalty program bonus points for all March Madness bets.